Cinemablographer: It's All About the Lens Flare! 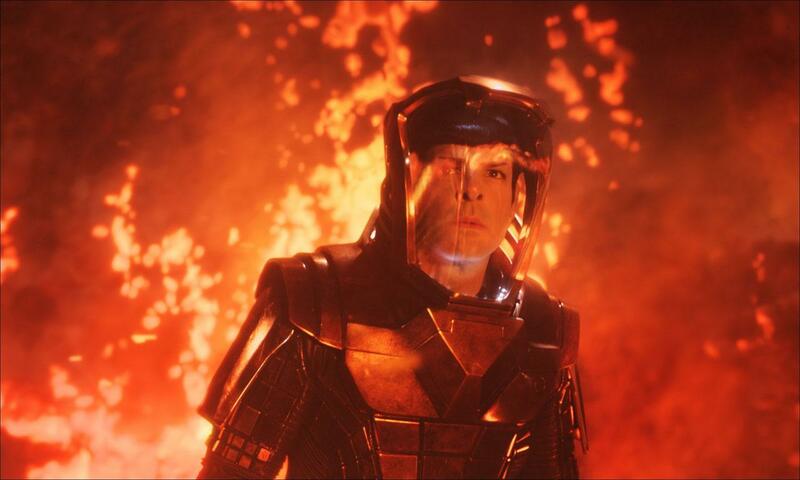 J.J. Abrams treads upon self-parody in his disappointing follow-up to his incredible 2009 blockbuster Star Trek. I’m not much of a Trekkie—I’ve never watched the TV series and I’ve only seen the Star Trek movie with the whales—so I was pleased when Abrams’ reboot delivered on all levels. One didn’t have to be a fan to appreciate the return of Captain Kirk and Doctor Spock, although the “oohs” and “ahhs” from the audience suggested that those who were enjoyed the film twice as much. Star Trek Into Darkness is as spectacularly grand as its predecessor is, but, unfortunately, it’s not nearly as exciting. Every scene of Star Trek Into Darkness looks as if it was staged and composed with an eye for adding gimmicky lens flare to each shot. 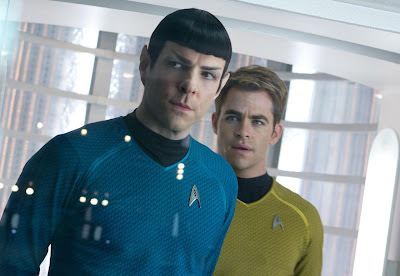 One watches Star Trek Into Darkness as if it’s playing out behind a pane of glass. Little lines appear virtually every time the camera moves past a source, and even more light shines in when characters move to reveal a new beam. The scenes are blocked as if the big reveal isn’t the mystery of the film’s villain (played by Benedict Cumberbatch), but rather to show where all the dazzling lights are hiding. Is Abrams doing some weird Brechtian thing? Jokes about Abrams’ near histrionic use of lens flare are admittedly pretty stale. (I griped about them whilst reviewing his Super 8 back in 2011.) However, the comical onslaught of gratuitous visual pizzazz in Star Trek Into Darkness shows how a director’s signature flare can completely overwhelm a film to the point of destruction. Lens flare is to Abrams what cranked-up music is to Baz Luhrmann. The visual nuisance is especially fatal since Into Darkness strings together a series of grand action sequences with a nonsensical plot. The film makes little sense, especially when one spends much of the time in befuddled wonder looking at all the dazzling lights that Abrams shines into the camera. It’s all about the lens flare! There’s actually a lot to like about Star Trek Into Darkness, though, if one can see what’s hiding in the shadows of Abrams’ lights. Into Darkness starts with a bang and doesn’t let up until the final credits. Abrams stages one extravagant sequence that is more visually stunning, lens flare aside, than the last. Perilous missions in erupting volcanos, cluttered meteor belts, and phaser-laden shootouts all keep the adrenaline going. The light speed of the film is also one of its shortcomings, though, since the script by Robert Orci, Alex Kurtzman, Damon Lindelof often sidesteps drama for action. Complications in the crew’s mission are often solved by quick conveniences—they don’t really have to work at anything or, if they do, they problem is resolved as swiftly and cleanly as one can imagine. For all hiccups in the clunky storytelling and for all the conveniences that help the crew of The Enterprise avoid the gaping plot holes, the crew’s mission in Star Trek Into Darkness is an immensely entertaining one. Especially entertaining is the bromance between Kirk and Spock, played by Chris Pine and Zachary Quinto. Taking their roles more like Abbott and Costello than like Butch Cassidy and the Sundance Kid, Star Trek Into Darkness takes the sci-fi story more into the frontier of the buddy comedy than into the world of exploration and expansion that one finds in the westerns. The kitschy, campy fun of Star Trek Into Darkness plays like a product of Star Trek for the YouTube generation crossed with the “gee golly gosh” escapism of Abrams’ kid-friendly adventures. Star Trek Into Darkness makes one notable win over the previous installment of the rebooted franchise. 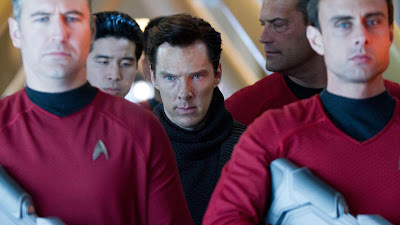 This Trek features a much better villain than the last (although there was nothing wrong with Eric Bana’s Nero) in the form of Cumberbatch’s John Harrison, a rogue Starfleet agent on a mission to destroy the organization. Cumberbatch (Tinker, Tailor, Soldier, Spy) is a brooding novelty and a surprisingly good fit for action. He’s a welcome baddie for the next Star Trek 3. Star Trek Into Darkness might not go boldly where no film has gone before, but it’s an entertaining enough herald for Summer Movie Season. It’s a popcorn movie that deserves to be seen on the big screen, although the unnecessary 3D might drive Abrams’ visual panache into overkill. Let’s call a moratorium on lens flare before the next Star Trek, shall we? Star Trek Into Darkness is currently playing in wide release.